SCVHistory.com LW2987 | Ridge Route | Tejon Trout Lakes, 1950s. 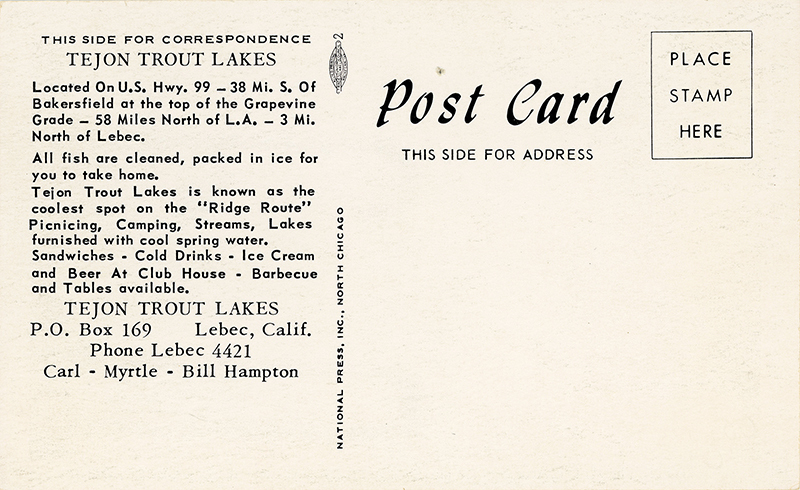 Advertising postcard for Tejon Trout Lakes on the Ridge Route, 1950s. As for the date, postcard publisher National Press Co. of Chicago was active in the late 1940s and early 1950s, approx. 1949-1955. The business operators listed on this postcard — Carl, Myrtle and Bill Hampton — were still in charge in 1960; Carl Hampton owns the fishery in a 1960 U.S. Fish and Wildlife list of "dealers in trout and pondfishes." It indicates he dealt in rainbow trout and catfish at the location. It also lists Hampton Bros. of Lebec as dealers in the aforementioned species as well as bluegill and bass. The prior operators were Bud and Bee Parker, who were identified as the "managers" if the trout farm in 1951 newspaper articles and other promotional materials. 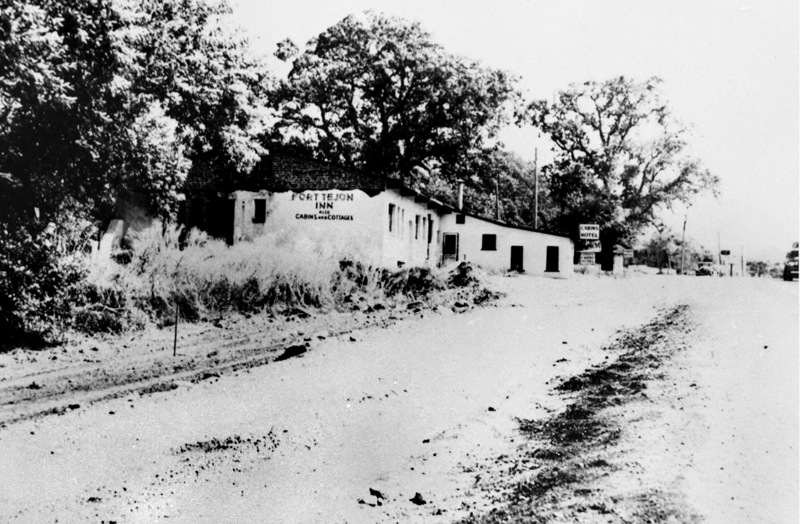 The trout farm traces its history to 1930 when Leonard Lawrence McClarty, a major player in the development of establishments along the Grapevine grade (see Harrison Scott: 2002), started the Tejon Angling Club, aka The Fish Hatchery, "a short distance south of the main entrance to Fort Tejon." Scott writes (ibid. :234-235): "The small facility included a nice restaurant with Indian decor and red-checkered tablecloths. A small building housed tanks for breeding trout. Outside there were large concrete hatchery ponds. Nearby in the wooded area, Leonard created trout ponds at various points along Grapevine Creek. Local fishermen enjoyed the Fort Tejon Angling Club only a short time. A fire destroyed the restaurant in 1932, and the club was never rebuilt." 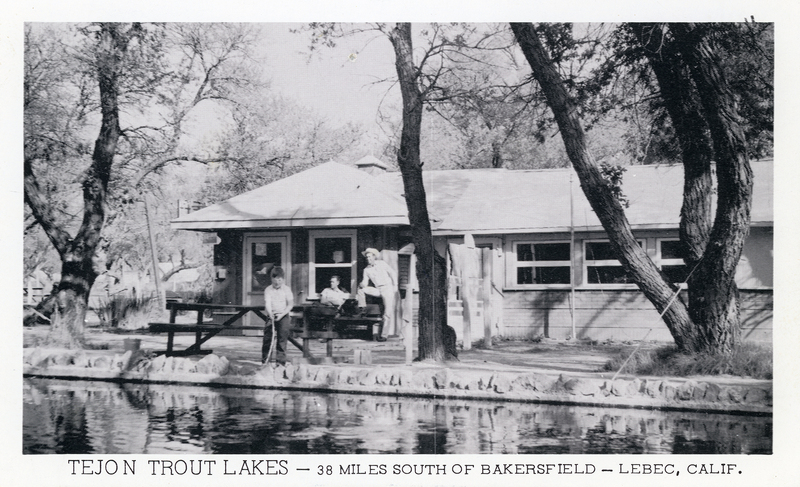 Turn up the clock to 1944 and Martin Yaeck, who lived in the Fort Tejon Inn after it closed, opens Crystal Springs Trout Farm "directly south of Fort Tejon on the west side of the highway where Leonard McLarty had operated his angling club in 1930" (ibid.:209). In the 1950s it was called Tejon Trout Lakes. TEJON TROUT LAKES — 38 miles south of Bakersfield — Lebec, Calif. Located on U.S. Hwy. 99 — 28 mi. s. of Bakersfield at the top of the Grapevine Grade — 58 miles north of L.A. — 3 mi. north of Lebec. All fish are cleaned, packed in ice for you to take home. Tejon Trout Lakes is known as the coolest spot on the "Ridge Route"
Picnicing [sic], Camping, Streams, Lakes furnished with cool spring water. Sandwiches — Cold Drinks — Ice Cream and Beer at Club House — Barbecue and Tables available. P.O. Box 169 | Lebec, Calif.
LW2987: 9600 dpi jpeg from original postcard purchased 2017 by Leon Worden.